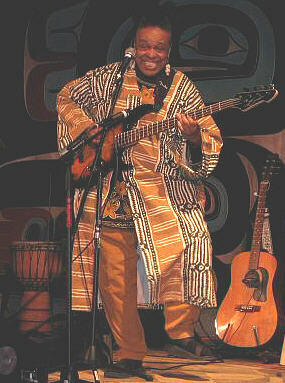 Paula Larke, musician, dramatist, writer, and a "story-teller / gatherer". Providing Program Design and Development, and Performing for Conferences, Seminars, Workshops, and Community Residencies. "I was knocked out by her witty, politically incisive blend of music, poetry and storytelling. Paula Larke is one of a kind. I just wish we had a million more like her." Daniel Falgerho Performances and workshops to excite children, teens, and adults with motivation, creativity, and a healthy dose of consciousness raising. Paula Larke is a dramatist, writer, musician, and, in her own words, a "story-teller / gatherer". 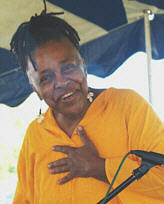 She was artist - in - residence at the Riverside Church, NY, until May of 2002. She is a veteran of the Broadway, Off-Broadway, and touring stages. 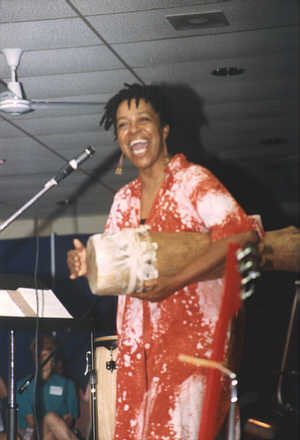 For over 25-years and counting, Paula has performed nationally, primarily in the South and Northwest, presenting chants, songs, and spirituals from Tuskegee, Alabama; the Georgia Sea Islands; the Blue Ridge and Appalachian mountains; and the Piedmont Plateau region of North Carolina. She tells and gathers tales, as well, from many cultures. She uses her stories and songs to illustrate Biblical and universally spiritual principles. Her work covers much territory: addiction recovery, school bullying and violence, racism, heritage, and, always, grace in healing. She is a modern-day djali (village chronicler in West Africa), carrying the personal stories of ordinary people to the altar of life for benediction and forgiveness. "She's a cross between James Brown and Nina Simone...."
Kim Diehl, National Organizers Alliance, S.O.N.G. "Paula's daily pursuit was to help others to uncover, scrutinize, and embrace their ever present potential for learning, developing, and succeeding at… their own special passions. I was amazed at the energy she exuded, both cognitively and emotionally…[she is] an ambassador for creative and positive existence."